Operation Christmas Child is a worldwide organization (run by Samaritan’s Purse) delivering shoebox gifts to children in need all over the world. From May 1 to June 2, AllFreeSewing.com is making it our mission to collect 1,000 homemade pillow cases to donate to Operation Christmas Child. Welcome to our Sew-A-Thon! Why 1,000 pillowcases? Our local OCC here in Illinois is hosting a Sew-A-Thon for homemade pillowcases this summer, and we'd love to be able to match their goal of sewing 1,000 pillowcases for kids worldwide. A pillowcase in an Operation Christmas Child shoebox gift can be so much more than just a pillowcase. It can be a bag, blanket, or security item to a child in need. How can you help? Make a pillowcase and mail it in to us and help us reach our goal! If you donate, you'll get an extra entry to win the Operation Christmas Child Pillowcase Sew-A-Thon Grand Prize Giveaway donated by Plaid! Read our full interview with Betsy Burnett! 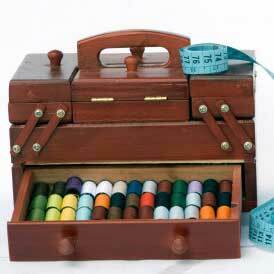 To celebrate our Sew-A-Thon, we're giving away a Plaid Christmas Sewing Kit Bundle valued $108.95! No donation is required to enter. You can earn an extra entry by donating a pillowcase to our Sew-A-Thon! More details below. Learn how to make a pillowcase with this step-by-step tutorial straight from our craft studio! This beginner sewing tutorial is perfect if you're just learning how to sew, because pillowcases are simple and easy sewing projects that you can make in no time. These DIY pillowcases are great for a quick upgrade to your bedroom, as a starter project that your teen or tween can make, or of course, for our charity drive! More of a visual learner? Then you're in luck because we've got a handy sewing video that shows you each step of the sewing process. From how to sew your fabric together to simple French seams, this sewing video tutorial is exactly what beginner sewists need. You don't have to worry about any guesswork with our video on how to make an easy pillowcase. Searching for even more great pillowcase tutorials? Then you'll love our collection of free pillowcase patterns that's perfect for beginners! For an extra giveaway entry, please include a slip of paper inside your package with your full name, mailing address, email address, and phone number. You will recieve an extra entry per pillowcase donated. To create your donation, we recommend using the free easy pillowcase tutorial provided on this page! (You aren't required to use this pattern, though.) Multiple pillowcase donations are welcome. Please send homemade, clean, unscented pillowcases in good condition - these are going to be given to little kids who need them! What's your favorite type of quick and easy sewing project? Let us know below in the comments! I agree with you that the video makes these so easy to do and I love that you can design the pillowcase the way you like. I need to make some to donate too. A big thumbsup for your support for homeless teens. What a worth while thing to do there is so many in today society. Bless you. If everyone would just donate one just think how many we can come up with. I need to get my sewing machine going and look through my stash pile. I just finished making a pillowcase to donate. Will be sending soon. The child doesn't need to know who gave it, he/she can feel the love in which it is given. My favorite quick project is making an apron. I think this Pillowcase Sew-a-Thon is a great idea. Even children need a pillowcase and the ones donated will probably make their pillow special to them. Some people have so little that the smallest gift can make them feel special. this is a good idea but right now so many are hungry and dying.....we need to feed them first!